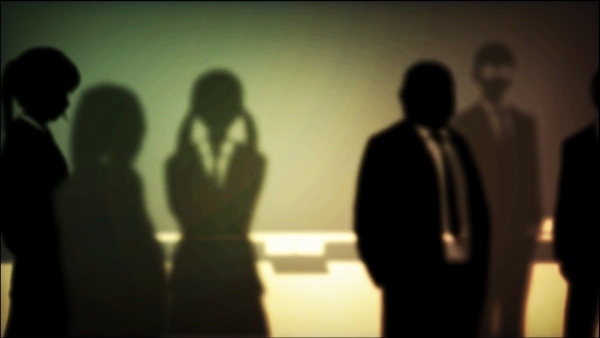 Interrogate Aya Fumino's friends to discover the truth. 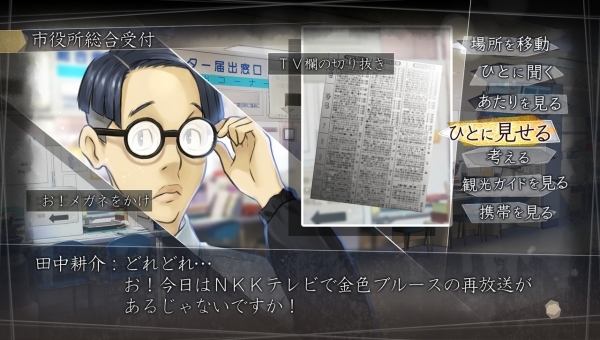 Kadokawa Games has shared new details on Root Letter, its newly announced mystery adventure game for PlayStation 4 and PS Vita due out worldwide in spring 2016. 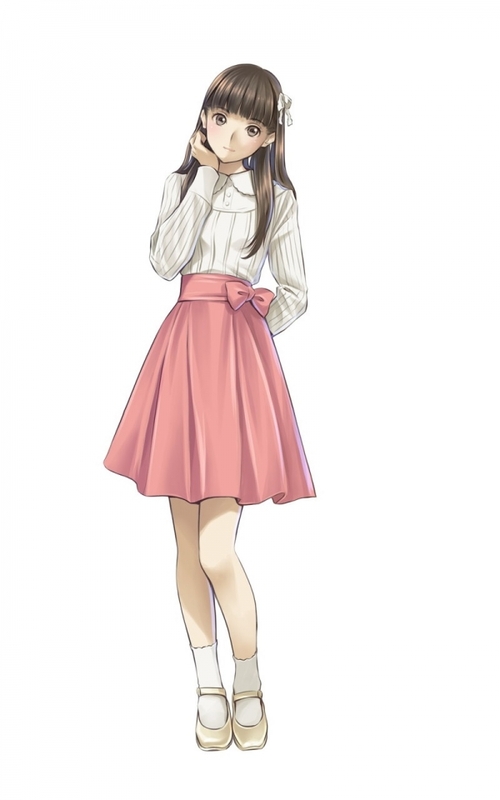 Aya Fumino, the pen pal friend of the protagonist from high school who disappeared after leaving a mysterious letter, is played by AYA, a fictional actress. Also detailed are the game’s adventure and simulation parts. 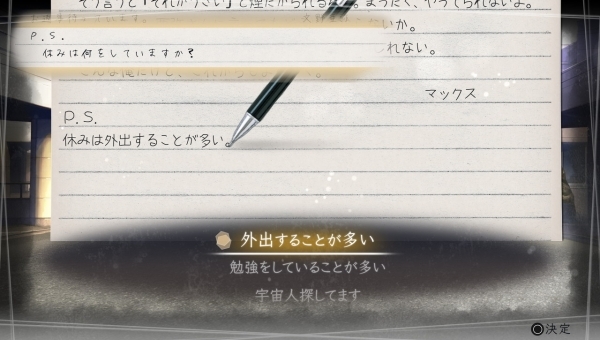 During adventure parts, you’ll interrogate the friends Aya Fumino wrote about in her letters. And during simulation parts, you’ll find in the contents of the letters you wrote to Aya 15 years ago as if you wrote them yourself. 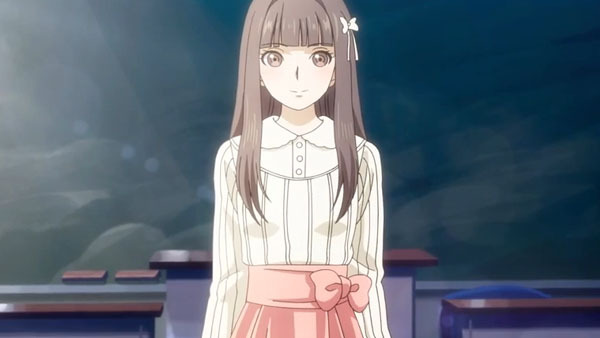 In the “Kadokawa Games Mystery” series, the characters that appear in the game are actors playing a role, and a common “mystery actress” will be appointed for a variety of roles throughout the series. In a video message released today, the mystery actress AYA thanks her fans for their support. Different from the Aya Fumino she plays the role of in the game, you’ll get a glimpse at the real AYA. Additionally, new mystery actresses following Aya are planned to appear in the future. Your pen pal from 15 years ago. At the time, she was a senior at Shimane Prefectural Matsue Oba High School. From the letters she sent you reflecting her high school life, she is a kind and compassionate person surrounded by good friends. While that was more or less the extent of what you knew about her, she was a good pen pal whose letters carried a bit of love towards the protagonist. Now, 15 years later, you find her last letter written just before graduation, and your idea of her is transformed. Was the school life she told you of all a lie? The truth lies in Shimane. Head there and discover the truth behind her identity. A 33 year-old man who works for the Matsue City Council Complaints Department. He refuses to talk about Aya Fumino, but his real identity appears to be the “Megane” (Four-Eyes) friend Aya wrote about in her letters. Although said to be the school’s utmost prodigy at the time, his grades began to fall after the summer of senior year in high school, and he didn’t make it into his university of choice. But he graduated from a nameless college, and although he holds down a steady job at City Hall, does not enjoy his life. His favorite phrase is “~desu yo ne” (“isn’t it?”). He has a bit of a stutter and a polite tone when he speaks, but no confidence in himself. And he is not yet freed from the spell he fell under 15 years ago. A 33 year-old man who lives in Tokyo. 15 years ago, although he had good will towards his pen pal Aya Fumino, when there was no reply to his 10th letter, he began to hate her. 15 years later, he discovers a mysterious 11th letter, and visits Matsue in Shimane Prefecture in order to find her and learn the truth about what happened to her. Leaving behind a mysterious letter, your pen pal Aya Fumino suddenly disappeared. To discover the truth, you’ll turn to the classmates she wrote about in her letters. 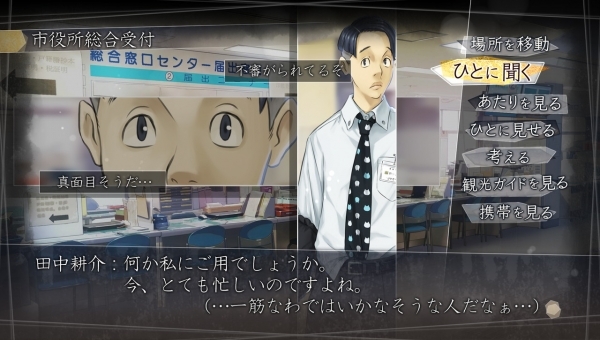 As protagonist Takayuki Nakamura, you’ll rely on the personalities, habits, and nicknames Aya wrote about in her letters, and locate her friends whose faces you’ve never seen. But for some reason, when you eventually locate these friends, they refuse to talk about Aya Fumino. Therefore, you’ll question them with the evidence and testimonies you gathered going around Shimane, and discover the truth they’re hiding about 15 years ago. 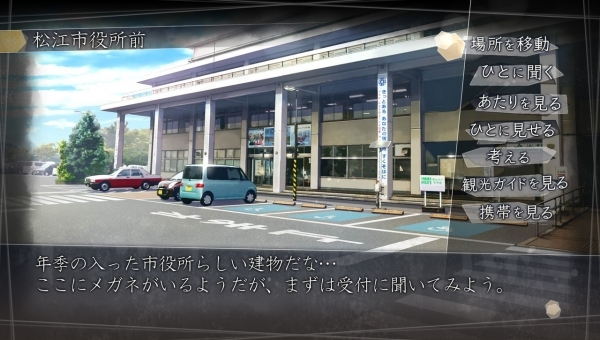 (1) After hearing that “Megane,” one of Aya Fumino’s friends, works there, the protagonist visits City Hall. 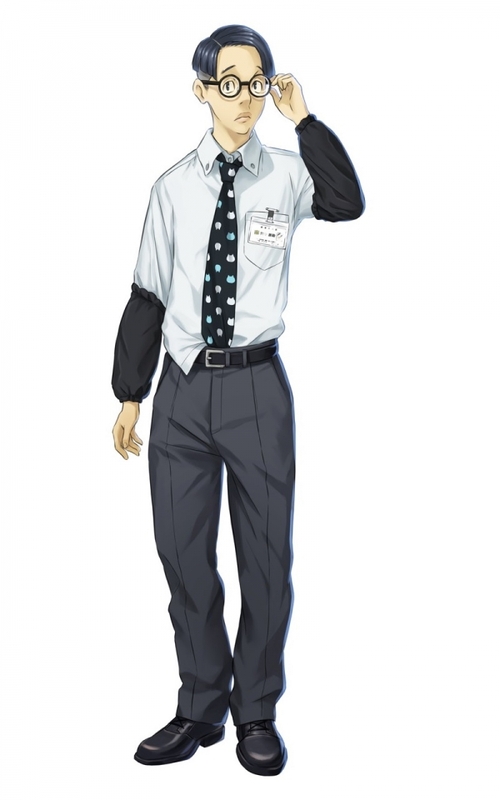 (2) But when he visits, instead of Megane (Four-Eyes), there is a man without glasses who says he doesn’t know anything about Aya Fumino. (3) But, after showing him a newspaper article about a TV program he is currently into, the man instinctively puts on his glasses. 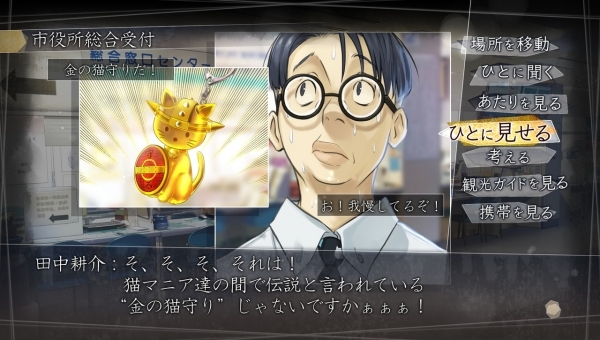 (4) Even so, the man plays innocent, but using the information you have about him as a “cat lover” from Aya Fumino’s letters, you can show him rare cat goods and invoke a great disturbance within him. During simulation parts, you’ll “reminisce” on the contents of the letters you sent to Aya Fumino 15 years ago. What this actually means, however, is that the player shapes the contents of the letters sent to Aya Fumino in that time by selecting from a number of choices. As a result, your favorability with Aya Fumino will change, and it will have a big effect on the story, which has multiple endings.